Meet Tobias Hickey – Bounce Sales & Marketing Ltd.
Tobias Hickey lectures in illustration, drawing and printmaking at The University of Worcester. His own illustrations have been published throughout Europe. Along with his colleagues they established the ICPBS (International Centre for the Picture Book in Society). Join him to find out how artists can help change attitudes and enable us to empathise with people who face dangers in their struggle to find a safer and better place to live. Children can create your own message and illustration on a post card, like the hundreds of top artists and authors – including Shaun Tan, Chris Riddell, Jackie Morris and many more – whose postcards form an exhibition that is touring the world. 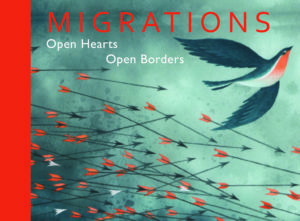 Many of the postcards are published in a beautiful book – Migrations: Open Hearts Open Borders. Otter-Barry will provide the postcards and colours – please bring kindness and imagination – to show that a small gesture can make a difference. Tobias’ creative workshops encourage children to talk about what they like about their home and why they wouldn’t want to leave it. Followed by seeing post cards with messages and illustrations from top artists (smaller events can look at the book/larger events will need to be able to view projected images) to people who have been forced to leave their homes. Then there is the opportunity to write and/or draw a message on a postcard. Postcards can form an exhibition within the venue or taken away. Or donated to the MIGRATIONS collection Ideal for National Refugee Week 17-23 June. For art students or an adult audience Tobias Hickey can provide an illustrated talk explaining how the ICPBS came up with the idea of inviting top artists to create an original postcard on the theme of ‘Migrations’ and how from the overwhelming response an exhibition was created which is published in May 2019 as a book. All royalties shared between Amnesty international and IBBY. Workshop – Ideally blank postcards with pencils and coloured pencils. For the talk there is a powerpoint presentation so a computer/lap top and screen are needed.